In December 2014 I lost my brother Marc. He had endured a mercilessly long and incredibly brave battle against multiple sclerosis. The stoicism with which he fought his condition astounded all who came to know him. Despite its sad inevitability, his passing was a painful one. He was only 50. Amidst the grief the idea of a Memory Pot took shape. As a maker of coil pottery, I looked to my art to find a way to express the imagery and symbolism of the life I shared with Marc. The making of the piece that resulted came to provide a positive, proactive and immensely valuable part of my grieving process. I now have something solid and tangible that I can literally hold and with which to recall the fond memories of the times I shared with him. It occurred to me that such an intimate process could be one to be imparted to others, through offering the opportunity to experience a similar journey to the one I took. Any Memory Pot would be unique, as only it could be if it is to reflect the special bonds that each person shares with their loved-ones. Individual input into the design of the pot is of course essential to this, as could also be an involvement in making the pot itself. The developmental and creative processes can be supported to whatever level desired. A themed pot offers an alternative to a bespoke piece. 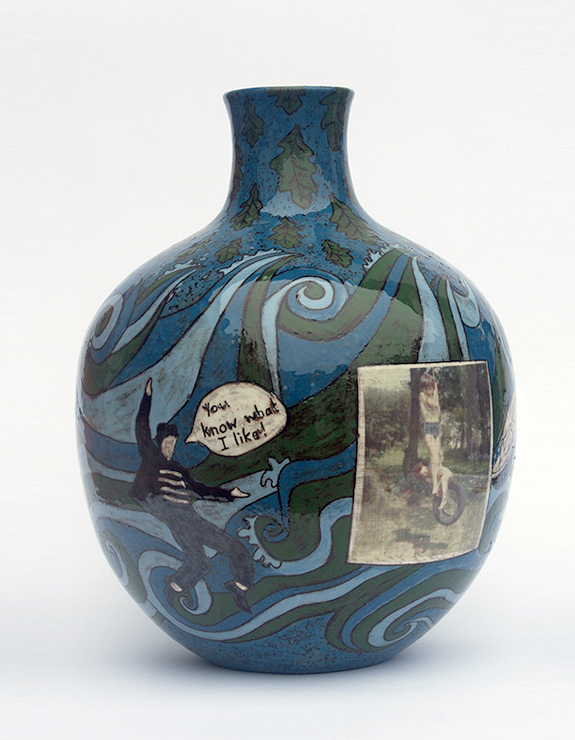 Photographs and images can be fired onto a pre-made pot. Surface decoration can be chosen from a selection of designs.